So vibrant. So rich with color like you've never seen. Reaching for the sky and setting it on fire with a seductive overload of provocative power. It's like a technicolor dream. A vision so alive you can't ignore it. 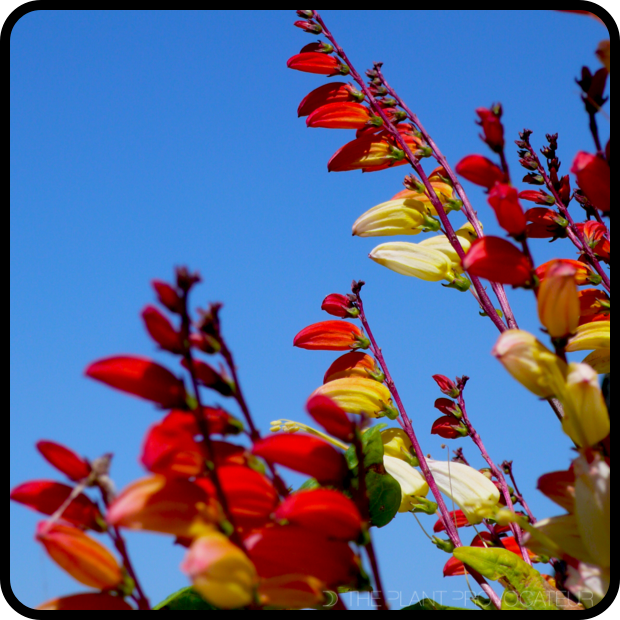 May I introduce Mina lobata also commonly known as Exotic Love Vine, Firecracker Vine, or Spanish Flag. This electric annual vine comes to us from Brazil. The flowers of it start off as rich scarlet buds slowly fading to an opulent orange, beauteous blonde, and then a charismatic cream. It's as if nature's drag racing lights are signaling the exotic beauty of this vine to get ready, set, and go! Mina lobata is one chic and unique vine to grow. It's fast and easy. Grows covering vines up to 10 feet in one season! From seed, vines spiral and twine out of the soil producing luxurious bronze-purple fleur-de-lis foliage that brightens to a fresh verdant green as it expands to maturity. Come mid-summer, 5 to 6 inch sprays of flower buds rocket outward from foliage and begin to bloom with a blindingly bodacious beauty through autumn. Mina lobata likes full sun, well-draining soil, and regular water. If planting from seed, nick seeds with a nail file or score with sand paper until outer coating thins then soak in room temperature water overnight. This will speed germination. Otherwise, look for live plants online or at nurseries. (Oh, and tell 'em The Plant Provocateur sent you.) Plant seeds in spring when the temperatures begin to warm. As plants emerge, provide them with a trellis or some other support to climb on and cover. Sit back and watch the vines fill with lush foliage and explode with ultra vivid color. Oh, and you'll have company too. The hummingbirds will be stopping by. With so many of the same old vines out there why not grow something 'outside-the-box' and experience the firecracker firepower and exhilarating ecstasy of a vine that's gonna give you some exotic love.